I have been obsessing over the OPI Rainbow Connection polish ever since i knew it was to be released in the Muppets collection! I used it last night for the first time for my works Christmas do and boy it didn't let me down! It is OTT jampacked with glitter and i am in love, I will let the pictures do the talking! This is only two coats of polish that has built up to a pretty opaque finish It would also look great as a accent nail or as a sheer coat over a colour nail polish. I bought mine from Ebay from the US as i do with most OPI polishes (I really cant stand that we are charged over £10 a bottle in the UK!) & it cost just over £6 with postage from this (Link!) seller, now were talking! I am seriously contemplating buying another even though ive only used it once as i love it that much! I would say that this is absolutely perfect for the festive season but knowing me, I will wear it all year round! Do glitter polishes float your boat? FYI I also used the Nailene false nails from the 200 pack in active square, I wish i could say i was graced with beautiful nails but unfortunately im not! 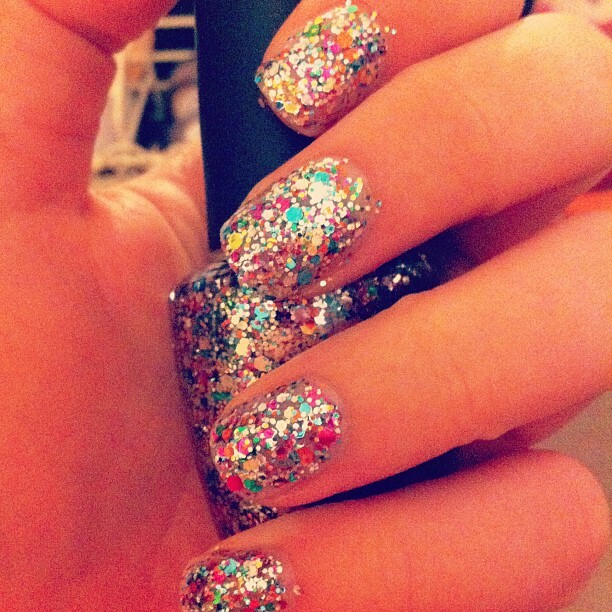 I adore glitter polishes! I'm sooo gonna buy this one soon!Thanks for sharing. This polish looks gorgeous, definetly going to add this on my xmas wishlist this year. Love it, its so festive and just so fun looking. I hate the price tag though, so expensive just for a polish(even if it is gorgeous!) definitely going to check out that seller. Such a gorgeous polish, I love how opaque it looks in these shots! Omg I need this in my life! That's incredible. I love it, Wow!!!! They look awosme. Hmmm I didn't get this result with only 2 coats, but maybe I don't have the right application techniques. I have found that with these chunky glitter nail polishes, you have to manoeuver the glitters to put them in place. I just found your blog and it is amazing! :D This colour is also so gorgeous! nice!! !do you think i can find it in italy!?? I've been needing to buy myself a pretty glittery nail polish, and i think i may have just found it! Wow what a statement! I need it in my life! I didn't even make it to the end of the post before clicking the link and purchasing that nail polish! Looks amazing! Do you have false nails on here? They look super natural - I'll be ordering that tomorrow I'm not that bothered about glitter polishes but this ons has really caught my eye. I love this!! Also got mine from the USA, so much cheaper even with the P&P! Oh my goodness, the Rainbow Connection is INCREDIBLE!!! Have to get this nail polish!! Good lord!! Its fab! !